How did N.C.’s GOP governor lose despite clear Trump victory in his state? North Carolina Gov. Pat McCrory nearly rode Donald Trump’s coattails to the finish line, but a torrent of outside money and the radical Left’s ability to push major sports organizations, businesses, and celebrities to boycott the state over HB2 ultimately brought him down, constitutional groups say. Meanwhile, Gov.-elect Roy Cooper is taking heat for selecting as his senior adviser a proud backer of San Francisco 49ers’ often-sacked quarterback Colin Kaepernick. “Roy Cooper is a champion of equality and for North Carolina values, and he is the right person to lead our great state moving forward,” said Equality North Carolina Executive Director Chris Sgro. 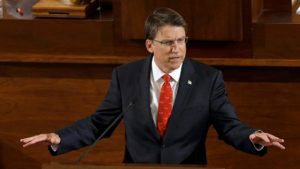 Constitutional groups say it was the left’s ability to turn HB2 into an economic issue, overshadowing the social aspect, that turned enough voters away from McCrory. The LGBT-rights issue would have lost in North Carolina on its own merits, the APP said. Columnist Mark Shiver blamed McCrory’s failure to respond to North Carolinians’s concerns about tolls on I-77 in Charlotte for his loss. Now, Gov.-elect Cooper’s appointment as his senior adviser a public supporter of San Francisco 49ers’ quarterback Colin Kaepernick is raising eyebrows. The choice of Ken Eudy as senior adviser “is troubling … in a state that is home to nearly 130,000 active-duty military personnel and nearly 100,000 military retirees,” the Civitas Institute wrote on Dec. 7. Throughout this NFL season, Kaepernick has been kneeling in protest during the playing of the national anthem. Eudy said earlier this year that he stays in his seat when thousands of fans stand and cheer men and women in the armed services. “I sit simply because I think it odd that, of all the categories of Americans that we honor, we honor warriors,” Eudy said.